Project Q character "Brian" is now complete. Here's the result. Personally, I like it a lot. I'm sure I've met this man before and not liked him, which I think is the point. I think what makes this character successful is the detail. "God is in the details", according to Meis Van der Rohe. 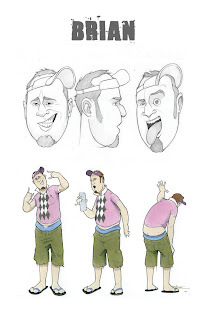 Though it's hard to imagine God being in a beer belly, tattered cargo shorts and a pink argyle golf shirt, I think these facets make the character look-worthy nonetheless.